Queenstown is actually spectacular in summer, with long leisurely days and a ton of sun-based activities to enjoy. Find yourself with a day to kill in Queenstown? Here’s how we would spend it. Whether it’s a croissant in Paris, a bagel in New York, an English muffin in London or pancakes with bacon and maple syrup in Ottawa, any day should always start with a good breakfast. When in New Zealand it’s no different, and luckily there are some amazing spots to indulge. One of our favourites is Vudu Cafe, nestled in the heart of Queenstown. Vudu Cafe is hugely popular, so much so that the owners were forced to open another cafe further up the street. Choose from a range of indulgent breakfasts such as toasted banana bread with fig and lemon marmellata and mascarpone or gibbston agria hash with chilli fried eggs. The cafe, which opened in 1997, is one of New Zealand’s most renowned cafes having received a huge number of notable awards. Fresh, local and fuelled by an organic philosophy, Vudu Cafe is contentment and satisfaction without overindulging. Described by Cafe Magazine as a “notable cafe that delivers superbly made coffee and top quality honest food”, a morning trip to Vudu means you’re sure to start your day right. Queenstown sits at the base of steep mountains, on the edge of the glistening Lake Wakatipu. Overlooking the city lies Bob’s Peak, part of Ben Lomond mountain. The common claim is that it takes 45-60 minutes to hike up to the Skyline complex, however following a big breakfast, you might like to allow a little longer. At the foot of Bob’s Peak sits an interesting small bird park, where you can see the rare kiwi bird and enjoy a naturalist show to introduce you to some of New Zealand’s native and introduced species. Ask about the free headset you can borrow, and learn in your own time about the local wildlife and haka history. The hike itself is beautiful, taking you through the pine forest up the Tiki Trail or you can take the gondola which will set you back around $32 NZD per person. 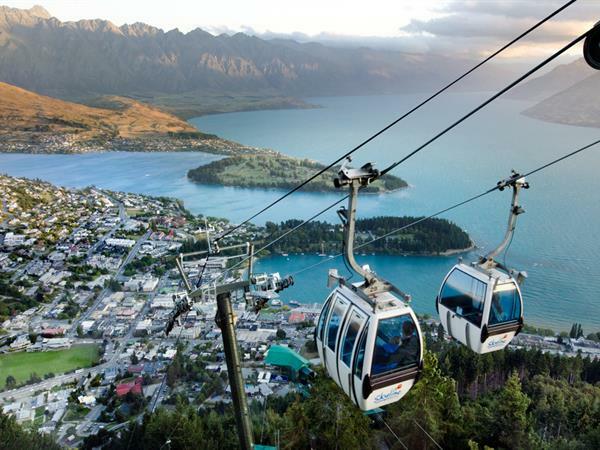 The gondola is the steepest in the Southern Hemisphere and takes you 450 metres above Queenstown and Lake Wakatipu. Once at the top of the gondola or once you’ve completed your hike, you are rewarded with some of Queenstown’s most spectacular views. From Bob’s Peak you can see Coronet Peak to the north and the iconic Remarkables mountain range to the east, both of which come alive in winter but sit silently stunning in summer. Across the deep blue waters of Lake Wakatipu you’ll see Cecil and Walter Peaks to the southwest. As for the Skyline complex, there’s a ton of affordable activities to keep you busy on the Peak. Skyline Queenstown is home to two Luge tracks – a scenic track or the bends and bumps of the advanced track. Accessed by a chairlift, Skyline luge rides are fun for all the family and considering they were invented in New Zealand, it’s only fitting that you have a go when there. Climb aboard your three-wheeled cart and let gravity and your sense of adventure do the rest. Alternatively you could opt for The Ledge Bungy and Swing which sits right beside the gondola and offers twists, flips, spins and dives all with an epic backdrop. The Ledge Bungy and Swing is a true example of the ‘up-for-anything’ Kiwi attitude. Before you come down the mountain in search of dinner, you’re going to need a game plan. The main street of Queenstown alone is packed with awesome eateries, so unless you feel like ‘winging it’ (you can’t really go wrong), then do some research into the city’s top eats. New Zealand chef Josh Emett is rated amongst the best chefs in the world, but the country boy from Hamilton has never forgotten his roots and now calls Queenstown home. His restaurant, Rata, was opened in 2012 and takes inspiration from the southern landscape and incredible regional produce. For any foodie visiting Queenstown, Rata is an absolute must. When a restaurant is consistently filled with locals, you know it’s a good one – especially when it comes to seafood. Fishbone is environmentally conscious sources only sustainable fish and shellfish from the waters around the South Island. Their catch comes straight from the fishing boats and is served fresh, daily. Seafood this good speaks for itself! Fergburger is an absolute institution to the locals and tourists of Queenstown village. An attraction in itself it offers mouthwateringly good burgers as big as your head, including the traditional Fergburger, the Little Lamby and the Holier than Thou. If you’re especially hungry, go for the Big Al, which delivers a double serving of prime New Zealand beef with lashings of bacon, a whole lot of cheese, two eggs, beetroot, lettuce, tomato, red onion, relish, and a giant wad of aioli. Delicious! Whether you fancy settling down for the night in a cosy wine bar, or you’re planning on dancing the night away in a club, Queenstown plays host to an endless list of great drinking holes. For the quiet folk wanting to get to know the locals over quality tap beers, Morrison’s Irish Pub is a friendly place to be. Home to good old fashioned pub hospitality and live music three nights a week, it’s a great place for a nightcap after dinner. For those who want something a little more sophisticated, Eichardt’s Bar is just a stone’s throw from Fergburger and has been serving locals since 1867. Featuring comfortable sofas, gracious service and timeless cocktails, it’s the only Queenstown bar where you can sip Bollinger by the glass. For the sunseekers wanting a full-service rooftop lounge bar, The Sundeck is located two doors down from The Bunker on The Mall and offers the ultimate summer atmosphere, taking in 360 degree views. After something a little different? Below Zero Ice Bar provides drinks in a very cool environment – so cool in fact that you need to wear a ski jacket, gloves and boots to enter. Everything in this bar is hand-sculpted from ice by two of the world’s top North American ice carvers, from the walls and furniture to the glasses and chandeliers. So there you have it – one sun-filled summer’s day in Queenstown. Have fun whatever you get up to, and remember to embrace the up-for-anything Kiwi spirit as you explore.